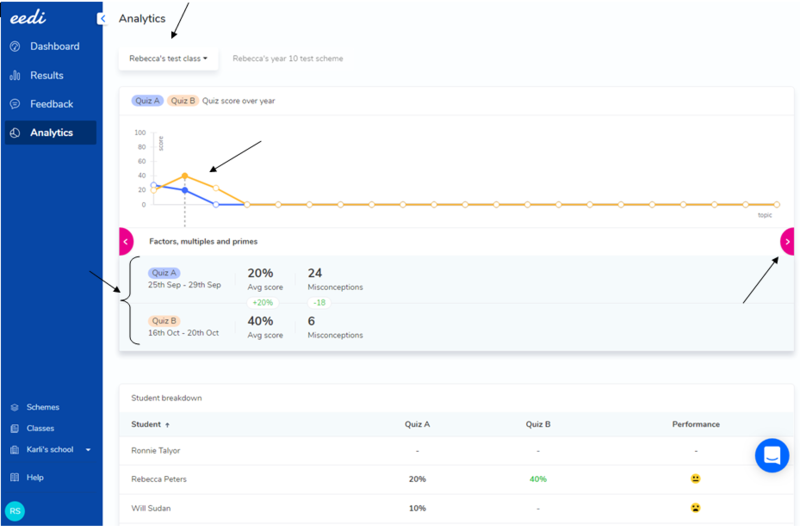 The Analytics page on Eedi can give you a great overview and comparison for the individual topics your class have completed and differentiates well between Quiz A and Quiz B. It allows you to understand class retention on a topic by topic basis by comparing Quiz A and Quiz B. You can also see pupil performance in the topic - and if their quiz result has increased, decreased or stayed the same. Take a look at the pointers below as to how you can achieve the most out of your Analytics page. You can select from the drop down the specific class you want to look at. The table indicates the average class score and you can see the difference between Quiz A and Quiz B for each topic - A great way to see at a glance comparison as to whether your students have improved after their second Quiz. You can view the average score for each quiz along with the number of misconceptions the class faced. At the bottom, you will see the student breakdown, this gives the percentage they received from each quiz, along with an overall performance rating. To move along to the next quiz, you can click on the pink arrow toggle OR you can click on the circular points on the table.